This Healthy Almond Granola Recipe will have you wanting breakfast for every meal and snack in between! Deliciously golden and toasty and filled with crunchy Australian Almonds, a variety of aromatic spices, scoops of seeds and coconut flakes and a lovely sprinkling of dried fruit. Preheat the oven to 160C and line an oven tray with baking paper. Place all ingredients (except the dried fruit) in a large bowl and mix well to combine. If you would like to sweeten the mixture, you might like to drizzle some honey throughout. Spread the mixture out evenly on the lined baling tray and bake for 15 minutes. Remove from oven and stir the mixture. Bake for another 10 – 15 minutes or until crunchy. Remove the tray form the oven. Sprinkle dried fruit throughout the mixture and allow to cool. Serve granola with some Greek yoghurt and fresh fruit for a perfectly balanced breakfast. This recipe was developed by Anna and Alex from The Biting Truth and proudly brought to you by Australian Almonds. Check out Almond and Banana Loaf and Healthy Snickers Bars; two more deliciously healthy and nutritious Australian Almond recipes. This looks interesting, I’m not sure I would like the taste. I’ve made this and it’s very filling and tasty. This sounds tasty and nutritious, thank you. I tend to buy rather than make my own… but I love all of these ingredients. Wow, sounds great. I could leave out the almonds and the kids could take this to school with yoghurt! I have no idea what Pepita Seeds are but I am keen to try this recipe. Amazing, great homemade breaky i can add to my morning yoghurt. 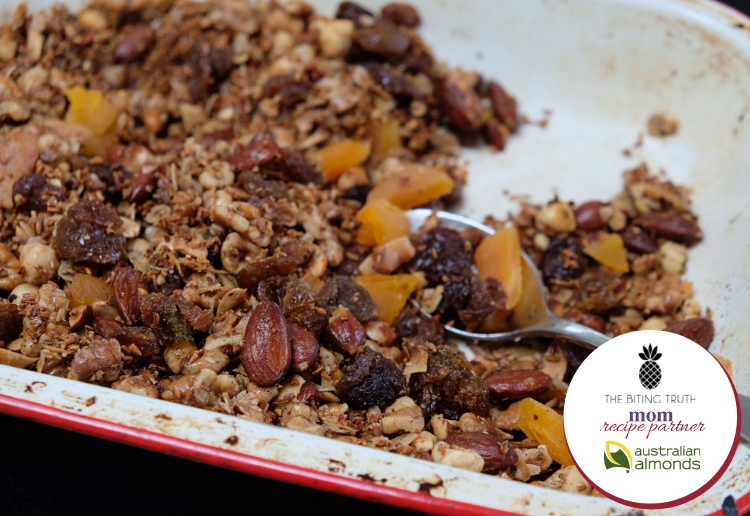 I adore homemade granola – simply the best. Homemade is so good because it can be adjusted and made to your tastes. It looks delicious. I would love to eat it with some Greek yogurt and berries.